Why FieldSurf’s Field Service Management Software? FieldSurf is the most affordable field service management software on the market today. It has changed the way service companies do business. FieldSurf integrates every aspect of your service business into a single program that can be run from any desktop computer, any tablet computer, and even a smartphone. Everything is viewable on a single dashboard – Scheduling, Dispatching, creating the Work Order, creating the Invoice, and obtaining the client’s signature and billing them electronically. FieldSurf allows you to instantly locate all your field technicians on a GPS map, and it lets you control all your inventory in your warehouse and in the individual technicians’ service vehicles. And it generates instant business reports on everything from sales, technician performance, inventory, hours worked, profit on each job and a host of other features. Every department in your service business can now be controlled and managed using FieldSurf field service management software. And your staff will love it – it makes everyone’s job easier. Your dispatch department will love FieldSurf because it makes their job easier. When a new call comes in, you know immediately if it is a new customer calling or a repeat customer. If it’s a new customer, the dispatcher will need to complete each field in the new Work Order. 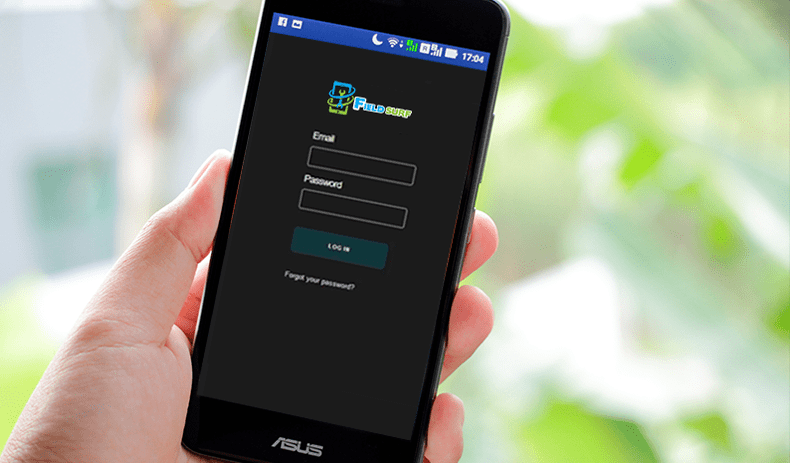 If it is a repeat customer, the dispatcher simply has to enter the customer’s name, address or phone number and FieldSurf will populate all the required fields with the correct information. And FieldSurf automatically creates a new Invoice at the time you create the new Work Order. No more forgetting to create the Invoice separately. As a security feature, the Invoice remains open until the customer has signed off on it and it has been emailed to his Inbox. After that, the technician can no longer make changes or additions to the Invoice – giving users an extra level of security. FieldSurf is one of the only field service management software on the market that allows you to control all your inventory from a single source. Simply scan an image of each item of your inventory, scan the product barcode into the system, and voila – you always know exactly what inventory is in your warehouse. When a technician takes an inventory item out of the warehouse and puts it in his vehicle, FieldSurf records that action, so you and each of your technicians always know exactly who has what inventory. If a technician has too many items of one product in his vehicle and he isn’t selling them, FieldSurf will help you to stay on top of this. And because you can now track your inventory in real time, you can prevent running out of any individual item. When a technician sells a product to a customer or consumes supplies in the course of a job, FieldSurf calculates the cost and selling price of the item in addition to registering the number of units added or sold. With FieldSurf you always know when to reorder product or supplies, so you never run short and you never run out. And your accounting department will love FieldSurf. No more separate software to do your accounting – FieldSurf’s field service management software integrates everything into a single program viewable from a single dashboard. If you’ve been using Quickbooks to do your business accounting, FieldSurf integrates seamlessly with Quickbooks – you can be up and running as soon as you import your Quickbooks data into FieldSurf. FieldSurf makes the job of the accounting personnel a whole lot easier. You know at all times which invoices have been paid, which have to be billed, and which are past due. Accounting can instantly generate reports on sales, expenses, hours worked and payroll due for any period. And as the business owner/manager, you can instantly generate those reports yourself, so you and your accounting department are always on the same page. FieldSurf makes the accounting function a dream. And your plumbing technicians are going to love FieldSurf. It allows them to access every aspect of their job from a single computer dashboard, or even on a smartphone. Dispatching and scheduling instructions and directions are transmitted instantly to all technicians, reducing or eliminating the amount of time your office staff needs to be in touch with your technicians in the field. Your technicians (and you) always know where in the field each of your technicians is. If a technician needs to get a piece of equipment from another technician, he can easily locate them all on the GPS map. And dispatch always knows where each technician is at all times: if someone is late to finish a job and will therefore be late arriving at the next job, FieldSurf automatically informs your office as well as the client by SMS text that the technician has been delayed, and it advises the customer of the new arrival time. Your technician can now stop for a donut and Coke without worrying about being late. Your entire business is in your hand with FieldSurf: anyone in your company who has Admin-level clearance can view any page on FieldSurf and access the information from wherever they are located – in the office, in the field, or even at home. As the business owner, you will love the way FieldSurf’s field service management software streamlines your service business. FieldSurf makes your business easier to run. You can access all your company’s data in real time — from any location. You always know exactly where everyone is, which jobs have been completed, which jobs still need to be completed. You always know which accounts have been paid and which are still unpaid. FieldSurf’s business analytics tells you all about the performance of your business – also in real time. You always know exactly how many sales you have made in any particular period, which technicians are performing the best and which ones are selling the most products and services to your customers. With FieldSurf field service management software, you will become more efficient, you and your staff will be able to do less work, your business will make more money, and you will have an easier time doing your job. Before FieldSurf, a service business was forced to use several different computer programs to accomplish all the tasks that are now accomplished with a single program. Before FieldSurf, you needed a dedicated scheduling program to run your scheduling function, another program to dispatch and track your technicians, another program to do your payroll, another to do your accounting, and another one to control and track your inventory. FieldSurf puts all these functions into a single program on a single dashboard – all accessible from any computer, tablet or smartphone. There is no software to download and manage: FieldSurf is 100% web accessible. And you don’t have to learn computer programming to run FieldSurf: just download the app from the Play Store, install it, and you can be up and running on the first day. If you can use a computer, you will have no difficulty using FieldSurf.